Diva Devotee: [Review] Bat for Lashes- "Laura"
[Review] Bat for Lashes- "Laura"
Spooky Diva Natasha Khan, aka Bat for Lashes, has returned to our mortal airwaves with new track Laura. An achingly beautiful song, that is built on the foundation of a sturdy and imposing piano score. 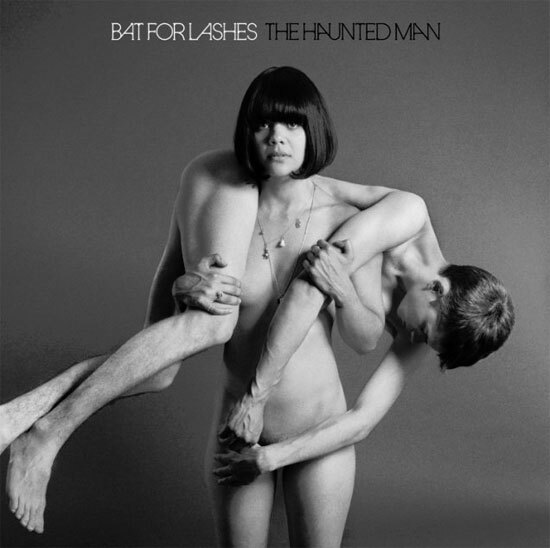 One which contains all the calling-card-chords and motifs that fans have come to associate with Bat for Lashes' dramatic musical styling. The vocal is as affecting as always on Laura, retaining its ghostly, other worldly quality, but there is a subtle change here, and it's noticeably warmer and vulnerable than previous offerings. The result is a song that moved me before I'd even had a chance to comprehend its lyrics. Surely some kind witchcraft is at work here! Laura is taken from Bat for Lashes' third, October released, album The Haunted Man. Pre-order now and Laura will be offered as an "Instant Download". This is the prettiest song I've heard in a while. I've had some tracks of hers in my iTunes library for years but never really spent much time listening to them. I'm going to have to re-visit now. Thanks for sharing! lol! IM TELLING THE POLICE! !While you wait for that knock on the door, do tell, what was the best song you've heard all week? to that first Mariah Carey tv performance of Vision of Love. Which was damn near perfect. I don't know what to say. It's beautiful but... I was confused during the first minute, I thought there was something wrong with this song, it should have had slightly different melodic line. What's wrong with it? I turned it off and started digging in my memory. It didn't take much time to get the answer - Lennon's "Working Class Hero". That's the main reason why "Laura" is so confusing. It makes me want to sing first lines: "As soon as you're born they make you feel small". I was meaning more contemporary "best of all week," but never mind. This still gives me some unseen/ unheard performances (bar Mariah) to get my teeth into. http://www.youtube.com/watch?v=RAFfzRorO1E . Her voice has a slightly more nasal quality to it, as well as being noticeably rougher but it's perhaps the most powerful rendition I've seen. It's not so much the technical voice, but more the emotion. Most other versions, you get a feeling of the nerves, or the fear of attacking an upcoming a note, but here it seems rawer and more aggressive. Also it was a two finger salute to everyone who said her voice had gone after the Charmbracelet album, so it had double importance for me because it was (successfully) proving a point. A point that the emancipation album took and ran with. You know what's really weird, I am a massive Joni Mitchell fan- I have all her albums- but even though I've heard numerous covers of "both sides now" I've refused to listen to the original. I'm not sure why... Allison's version is perhaps my favourite rendition now, and is how i imagine the original to sound. As for Dolly this is too sad for me to be listening to first thing in the morning...lol. But the voices are beautiful together. Sarah Jarosz I need to listen to a few more times, and preferably with lyrics, as it seems like a lot of the songs power is contained within them. I will be seeing if i can find her album too. I will definitely check that out., I've been meaning to try getting into the Beatles/ Lennon as they say a lot of modern music is built around things they established. But I'm always wary of things/people with massive hype/praise. I like to find things/ or come to things on my own terms, naturally, and this hasn't happened with the Beatles/Lennon yet. Yes, I imagine that Dolly song is not for first thing in the morning. It was very late in the early morning as it were when I listened to it. Sarah I can highly recommend to check out. In fact, I just posted a link to a playlist for T in the Mariah judging on AI thread. Hmmm...this song is awesome but it sounds too similar to "Working Class Hero" by John Lennon.